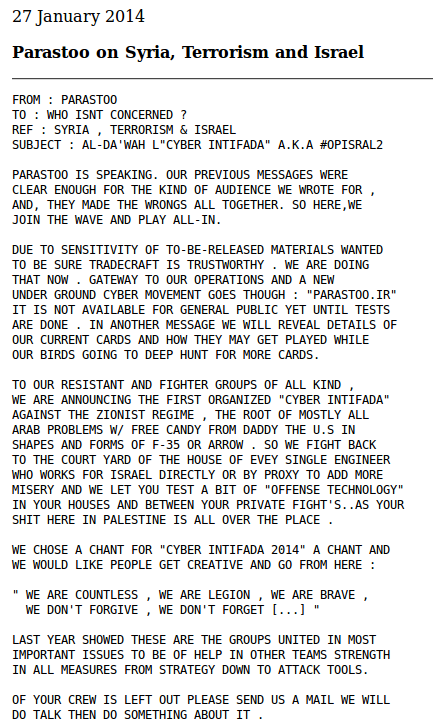 I got a tweet today about some data sitting on cryptome.org that got me thinking about this “group” again so I did some more digging online on them (him) The name of the “group” is Parastoo (پرستو Farsi) which means Swallow or bird. In the last year this guy (yes I think it’s literally one deranged person) had been active on at least two .ir sites that dealt with security and hacking and then started his own domains to ostensibly carry out cyber war against Israel and attempt to leverage the IAEA and others. So far all of the alleged hacks and data dumps that I have seen have not impressed and the data itself seems to be from systems that they “think” are important but in reality they are not. Specifically of late there are threats concerning CIA plots and diatribes that read like Lulzsec on methamphetamine and Ketamine at the same time. This guy really has quite the beautiful and large tinfoil hat and he wants us all to know about it in no uncertain terms. It is interesting to read between the lines in a stylographic way how the writer here seems to be molding their communiques in the manner of Zodiac. with a third person approach that intones more than one person and that this is a group. By using “Parastoo is speaking” they come very close to the “This is Zodiac Speaking” which attempted to portray power and induce fear. It is also interesting to note the language used in the emails is of a nature that implies a good grasp of English as well as a flare for the overly dramatic which does not lend credence to the threats that they imply. In fact the reading I take away, and seemingly the press as well, is that of someone either trying too hard to be Anonymous or smacks of outright trolling. 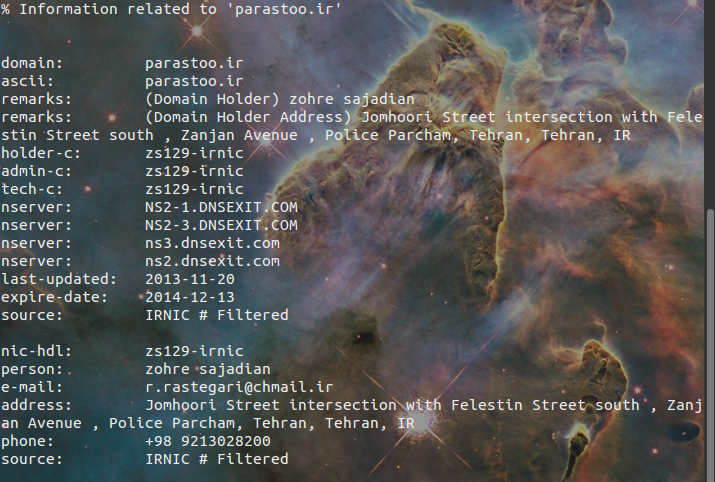 In tracing the domains for parastoo.ir and hacker4hire.ir I came across a defunct site (RCE.ir) which was a PHBB site that is now offline live but is archived in a couple of places as well as Google caches. When searches for “Parastoo” were used a clear link to a user on the RCE.ir site came up and that user was “DarkPassenger” who posted often on the site not only about hacking tutorials, tools, and the like but also dropped many links to government sites in the US and talked about conspiratorial things in nearly every posting. The DarkPassenger’s favorite saying or ahorism in each posting was “de nobis ipsis silemus” which is taken from the Baconian epigraph to the first Critique and translates to “on ourselves we are silent” which is ironic for all the commentary that DarkPassenger is putting out there that speaks to his state of mind. The DarkPassenger is also a fan of TV and movies and can be tracked to other .ir sites but generally from the first searches, does not have a lot out there under this account name to go much further (at present writing) to say who he may be in real life. 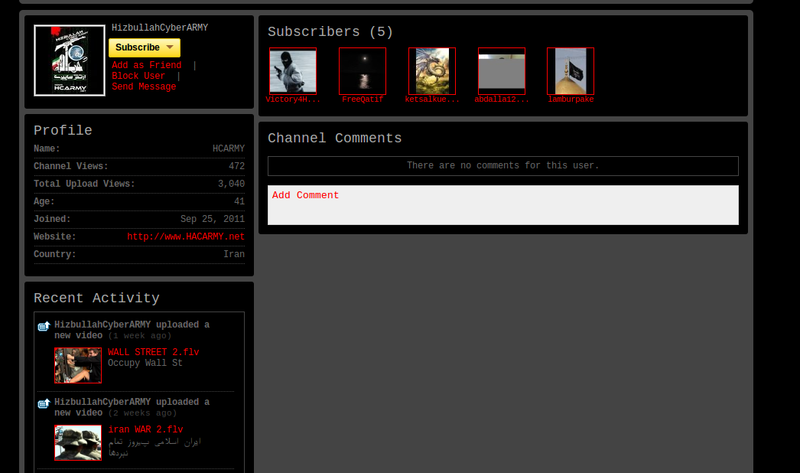 DarkPassenger though does seem to have quite a bit of time on his hands and some technical capabilities though. Much of the data however that he and Parastoo post though is really just OSINT that anyone capable could carry out. In fact in one post (DP) talks about OSINT while laying out informatics on a military organizations email addresses and contact list so he is in fact versed in the ways of OSINT collection. A key factor to the link I am making between the Parastoo and DP is that he uses the “EXPECT US” cutline in many of his posts as well and seems rather enamoured with the idea that he is in fact an Anon and that bent of conspiracy and overarching plots infuses the majority of his postings online. 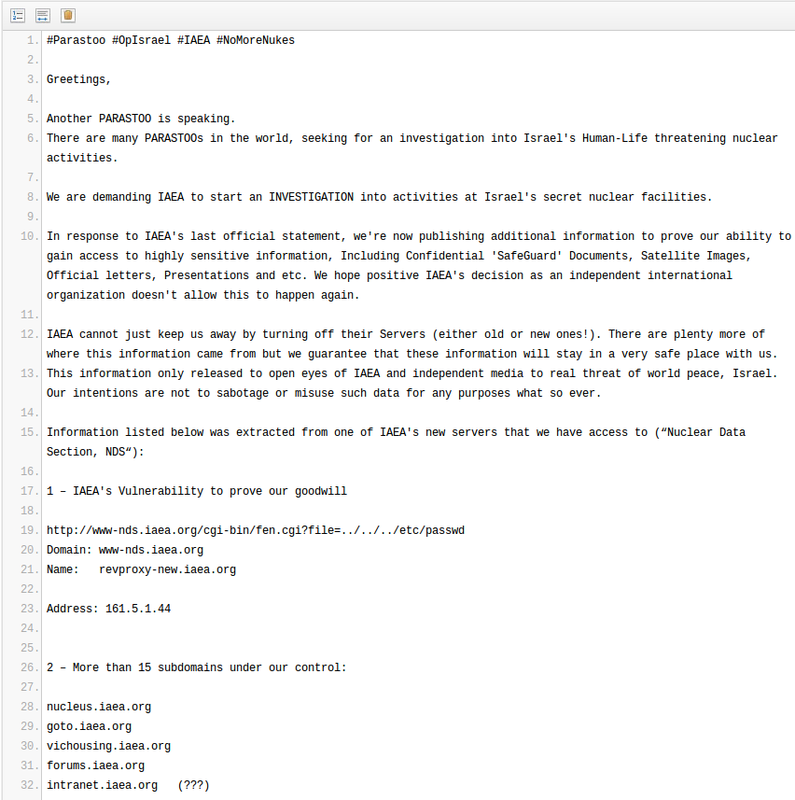 The postings claiming hacks as well as those that rave on claim that DP had set up a couple domains for “attacks” on the outside world from the .ir domain. 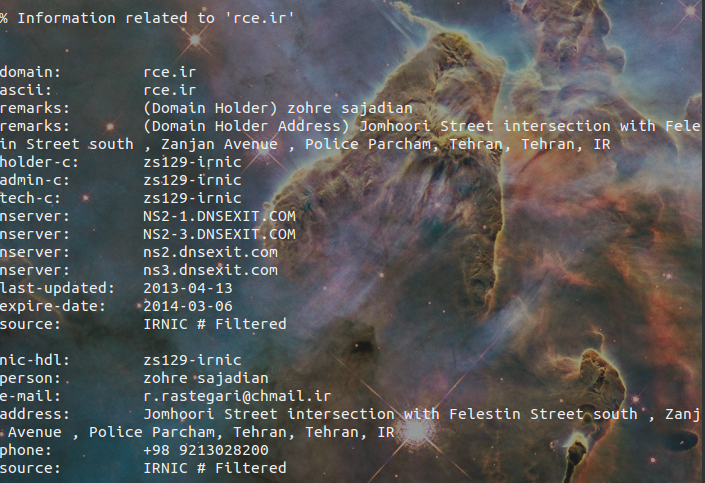 These domains are registered by what I assume is a cutout name of zohre sajadian which coincidentally was also used for the RCE.ir site. All sites are currently down and in fact I cannot locate any content for the hacker4hire.ir nor the parastoo.ir sites respectively. The only one that did have active content for a while was the RCE.ir address. 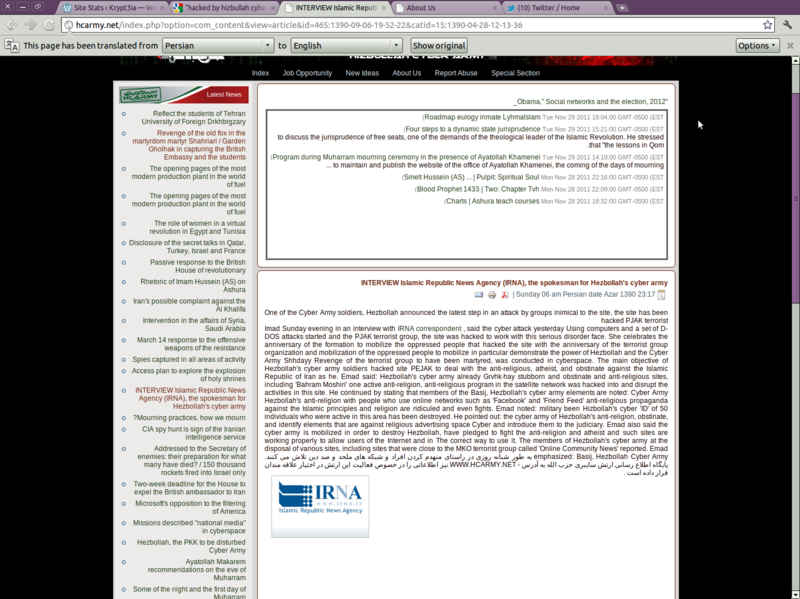 This site was up for quite some time but was insecure and much of the content was not that interesting. 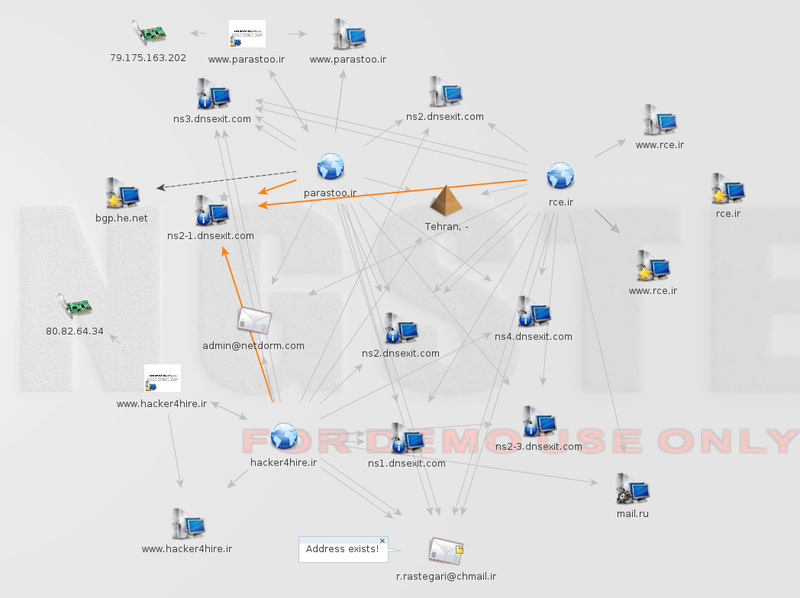 It is of note though that the domain registrations all line up as well as there seems to be some overlap in email hosting between a .ru address and the chmail.ir site (that address is verified as being real)The information for the address as well as the name of the holder seems to be just made up. 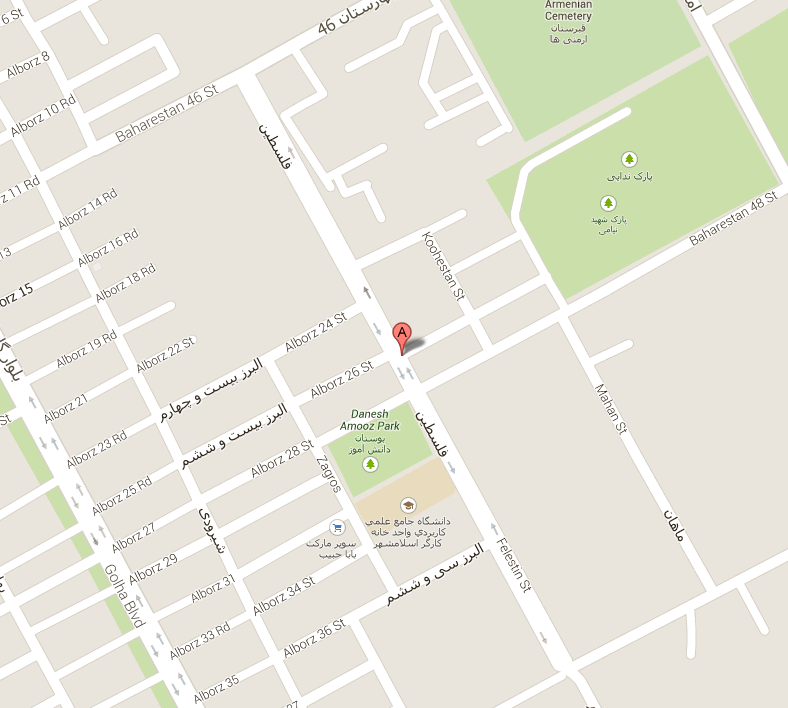 In fact the address cannot exist because there is no intersection for Felestin Street with Johmoori. 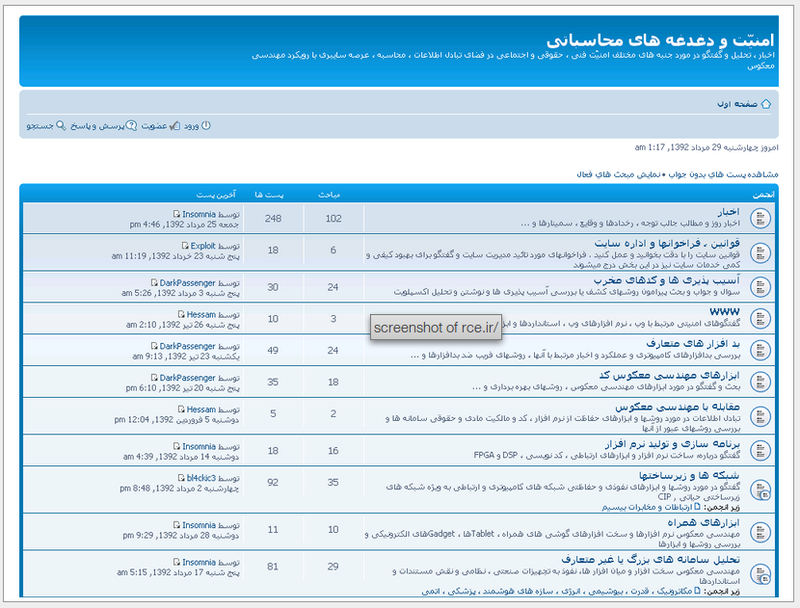 A cursory look at the name used of Zohre Sajadian also comes up with some hits but they seem to be un-related at this time to the sites and their registration so mostly this is a dead end I think. So far in my searching I have not found too much out there to support any large hacks of data or dumps thereof that show this “group” has done what they claim they have overall. Aside from news stories (few in fact) that claim Parastoo made off with “sensitive” information on nuclear systems and facilities. However the data that they claim to have taken and was admitted to by IHS Inc. is all of a nature that can be purchased from the web or has been published already in the past. The only real sensitive information that has been possibly breached was credit card information that may have resided on those servers that were compromised. So while the Parastoo makes grandiose claims of important hacks and data leaks, thus far, when really investigated they have yet to make a major hit on anything of real import. Since the sites have gone dormant or offline as well it has yet to be determined what else they may be working on or have compromised but if you look at the rhetoric from their pastebin posts as well as the alleged emails on Cryptome one becomes a bit jaundiced and must take everything they say with a large grain of salt. Another factor to remember that even with the drawings like the one at the top of this post are often available to anyone on the internet either by insecure or misconfigured servers or in fact the data is meant to be open to the public. This is a paradigm I have learned about recently in looking into the OSINT on nuclear facilities and systems. So these dumps of information are not what the attackers think they are because they are unacquainted with the data and it’s secrecy or lack thereof. 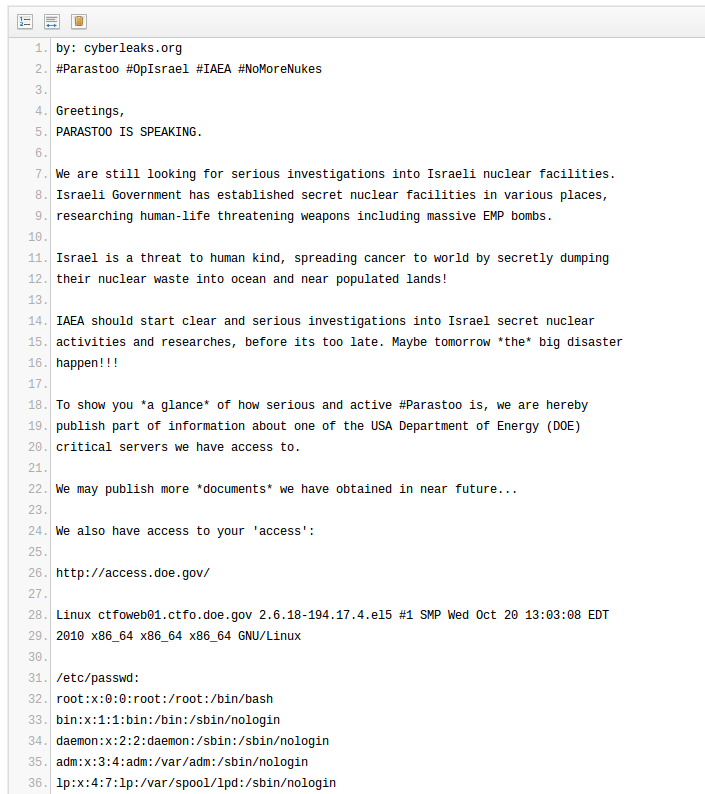 The final analysis of the “Parastoo” group is that in reality it is at least one person (DarkPassenger) who wants to make a statement on Israel and nukes with a fixation on IAEA and DOE. While some pastes in the pastebin list seem to have actual data from systems that are externally facing to the internet (DOE for one) the majority of the data seems to be half understood misinformation being spewed to garner attention. As the Anonymous model has been let out of the bottle so to speak post Lulzsec, there are many who would aspire to their level of reputation and attention and these dumps are an attempt to attract it. Of course the problem with the Anonymous model of operation is that anyone can take on the mantle and claim to be an Anon or a group of them to effect whatever outcome they seek (mostly attention) so it is oftentimes hard to take groups like this seiously until such time as they dump hard data onto the internet for all to see. In the case of Parastoo none of this is evident and as such I categorize (him/them) as a non threat actor on the larger stage of geopolitics and information warfare at this time. 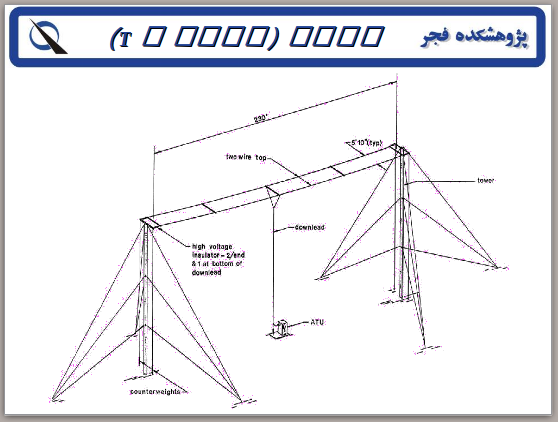 So, there has been a lot of supposition on the blogs and in the news about just how our wayward RQ170 drone ended up pretty much intact and in the hands of the Iranians. In looking at all of the posts online and in the news as well as talking to a knowledgeable source or two, I decided to attempt a little OSINT on the issue and I think I have come up with some more tidbits for everyone to think about. I believe that there is a middle road here to be tread on just how this happened and I would like to think that the potential for such an attack on a drone like this would be hard to pull off, AND that the military and Lockheed had taken into account such attacks before deploying things into the field.. But, we all know mistakes are made and hubris abounds. After the RQ went missing, and subsequently showed up in Iranian hands, the Military began saying that there was just a “malfunction” however, the malfunction had to have been system wide and epic after seeing the images of the RQ170 intact. You see, there is a self destruct as well as other interesting features on this bird, and if that failed then there had to be a large systems failure, but the question then became why was the RQ still intact? If the systems had failed completely, should not the RQ be in pieces at the very least from falling out of the sky? 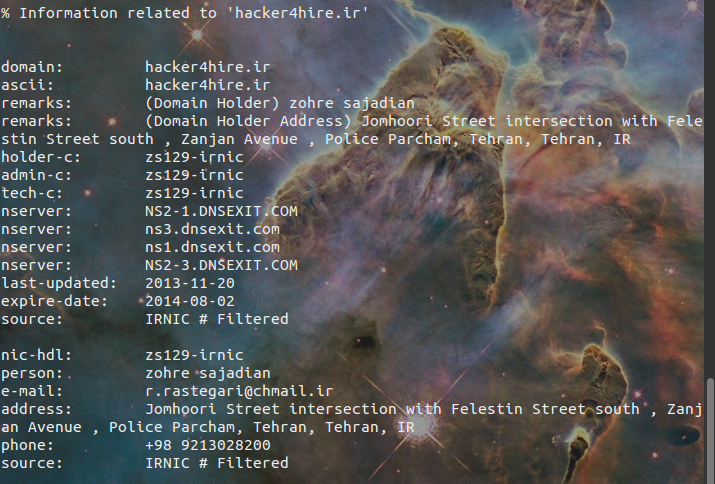 After a week or so, a report came out of Iran from a “source” that claimed the RQ had in fact been brought down and landed without incident through a GPS attack on a flaw in the system. This type of attack had been talked about before and it was possible per empirical testing that a GPS system, even a Military one, could in fact be subjected to attacks that would confuse the GPS system into believing it was elsewhere other than it’s real current position. So, the precedent is there, even though the Mil systems would take a bit more effort, it was in fact possible to the right people with the right technology and know how. So, once again, the possibility is there and we had a drone in the neighborhood… Did they indeed “spoof” the signals? 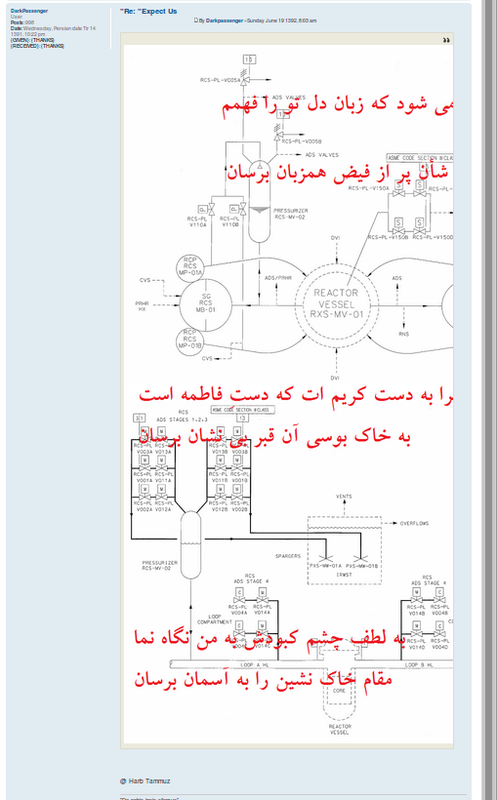 It seems that Farshad and Azimi have been working on an analogous project for Iran that also could possibly be used as a launch pad for a spoof attack. 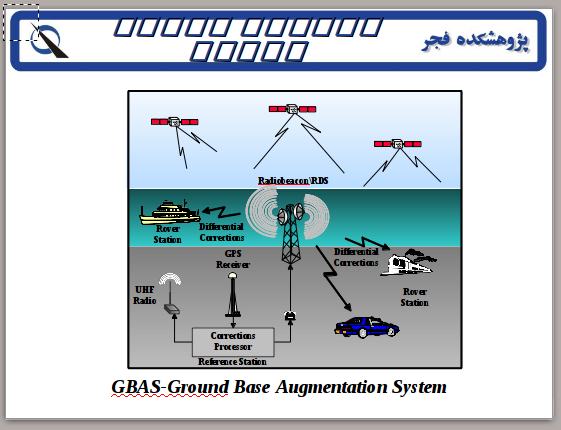 The documents (pdf files and Powerpoint) show a program to “augment” the GPS environment in Iran by placing base stations with the Fajr GPS (GBAS) network/hardware in specific sites throughout the country to ostensibly help with aircraft navigation. However, even in their presentation, they mention the possiblity of spoofing and though I don’t have a great translation as yet of the Persian (soon I hope) it seems as though they brought this up as either a potential issue or, as a potential boon to the implementation of the system. 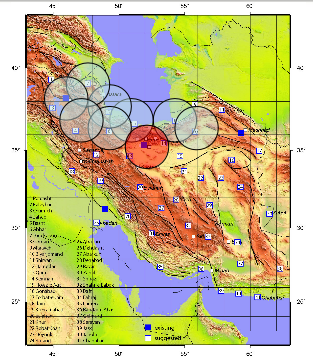 Though, to me, it seems that having such a network of broadcast sites out in the desert one might be able to overpower and spoof the signal of a GPS system in flight on a drone over Iranian airspace makes it all the more possible. You see, the basis of this attack is to overpower the signals from the satellite and make the on board system think it is elsewhere via data lag. If you look at the proposed and existing sites in the PowerPoint, you can get an idea of the scope of the project. Mind you, this all was started in 2004 and the PowerPoint was last updated in 2007.. So, this has been ongoing for a while. A while that we have also been starting to use the drones more and more coincidentally. Meanwhile, the reports that are circulating on the net and in the news also remark on the fact that Iran recently took possession of some 1L222 Avtobaza ELINT trucks. 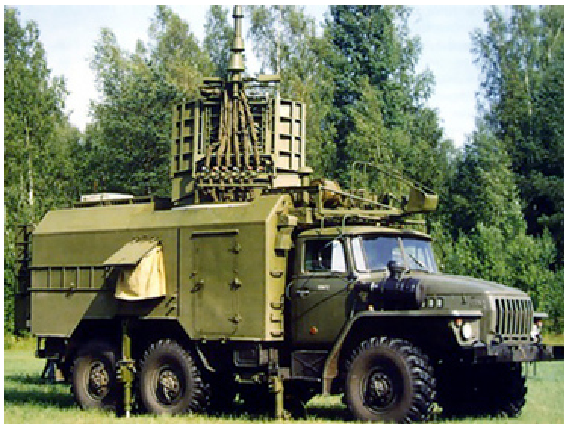 These may in fact have had some part in this process as well, however, it is rather sketchy at this time to say whether or not the Avtobaza has been moded to work in the satellite ranges as opposed to its main function as a radar jamming station and RF intelligence gathering tool. So, I can’t say for sure, but it is also possible but I am leaning toward the home brew that Azimi and Farshad worked on as the more possible, with mods, to actually pull off an attack on an “M-code” system. I had been leaning toward the Avtobaza before, but after all my searches and what I found, I have to back off that idea a bit. 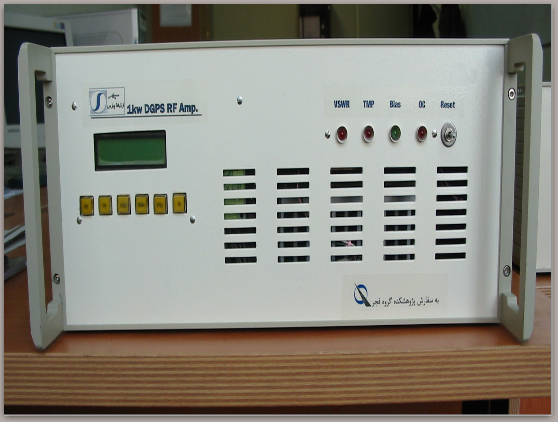 The fact though, that they have this technology means too that future drones will have to be careful in Iranian airspace as well as all of the border states need to be careful as this system can jam their radar systems and allow attacks potentially to have a leg up. Overall, even these finds only paint a picture of supposition and educated guesses. What we have is a missing drone that seems to be intact and failed to do everything it was programmed to do (self destruct etc) and yet landed intact. Without an attack that is now becoming more plausible (GPS spoof) how do we explain it all? Certainly Lockheed, the CIA, and the Military won’t be telling us all anytime soon will they? The fact that the Iranian’s started off with just saying they had hacked it, then letting loose with the technician (un-named) saying that it was easy enough with a GPS spoof kind of leads me to believe on this account, they are telling the truth. … And doesn’t that make us look foolish huh? In my book, they scored one on us… Now I just hope that the Military and Lockheed learn from this as well as the other incident with AQ and unencrypted Predator feeds and fix the problems before they launch more advanced drones in country. A recent investigative report carried out by Univision (Television de Espanol) released this month has some pretty powerful footage showing an undercover operation that sent college students to propose cyber attacks on the U.S. to the Iranian ambassador in Mexico. 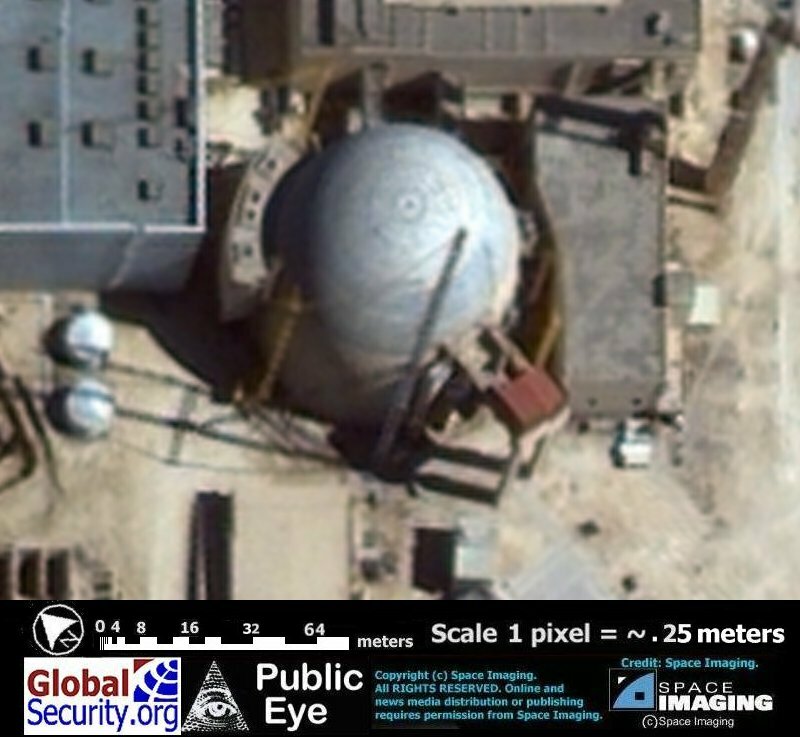 Ambassador Mohammad Hassan Ghadiri was approached with hidden cameras and talks were held to discuss the potential for state sponsored (by proxy of Hezbollah) attack on the White House, FBI, CIA, and nuclear power plant systems within the United States. The footage in the report clearly shows the ambassador talking about these topics and also asking about how to further this by making certain contacts. Now, of course this whole story is sensational and of course the Ambassador could just as easily say that he was leading them on to get an in on those who would like to attack the US to use in other ways, not necessarily that he was actually plotting against the US. Though, the likelihood is that the Ambassador was playing along in hopes that perhaps the Mexican students could be used as a proxy against the US and thus keep his hands clean.. A win win for Iran and himself really. However, there is a bigger story here than just the plot as laid out by the college student to the ambassador and his interest as well as the interest of the Venezuelan officials also caught on camera accepting the plans from the Mexican students. The bigger and ongoing story is that of the connections between Iran and various countries in South America and their use of cocaine trafficking to further their agenda’s world wide as well as focused on the US. The report goes on to cite others in the US and in the various governments in South America laying out the framework for a bigger picture on Hezbollah, narco-trafficking, and the potential for the semi porous border between the US and Mexico to be used to infiltrate Islamic terrorists (Hezbollah and others potentially) into the Unites States. The report cites as well that there are connections between mosques and training camps in Venezuela that also get support from the aforementioned narco-trafficking. 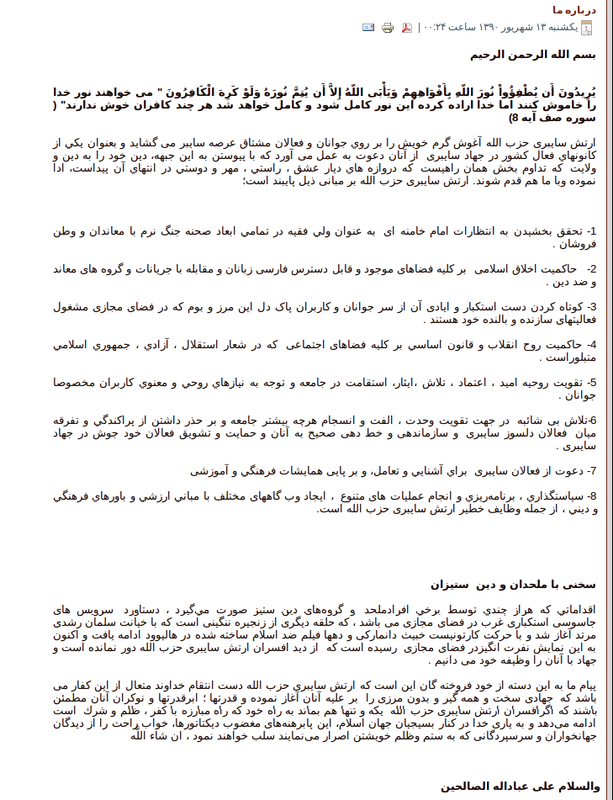 The actual “plans” given by the college students to Ghadiri were not shown or elaborated on in the Univision report, however, one can assume that they included the STUXNET type attacks that hit Natanz but also perhaps denial of service attacks as well on the FBI, CIA, and White House. Since there is nothing really to work with on this, I cannot say for sure, but, one need only look toward the “Hizbullah Cyber Army” that Iran recently unveiled to see where their ambitions lie after being spanked so well by Stuxnet and whoever carried it out. No doubt though, the Iranians would seek to welcome the likes of the Mexican hacker community to their effort as the Mexicans have had a track record with regard to hacking and digital scams in the past. Once again though, I would like to see people have the realistic reporting that there was no real cyber plot, but instead that this was the entre into the Hezbollah by offering such a plan or plans… Let’s not let the media run with this cyberwar angle ok? The plans that the college students passed to Ghadiri also included talk of EMP attacks as well as cyber attacks against infrastructure. The EMP attacks are of interest in that they could be carried out by missile launches. Launches that could come from sites that Iran and Venezuela have allegedly talked about having in place in country. So far as I am aware, the only real way that an EMP of worth, could be carried out by such as Iran would have to be a high altitude detonation of a nuclear device. Which means that Iran really probably does plan on having nuclear weapons as opposed to their claims that they only want to have nuclear power for the country. Frankly though, I do not see that the plan and this report should just be seen as a cyberwar piece. This all begs much larger conventional questions about the moves that Iran has been making in South America and now Mexico. Hugo Chavez has been getting closer and closer with Iran for some time now. Venezuela and Iran have forged close ties and much of their work together has been over more than just domestic and financial issues. It seems from the Univision report, that also the two have been working together on Nuclear programs. Iran has been working with Venezuela on plants there and I am sure that Venezuela has likely been acting as a cutout for certain things that the Iranians would like to have (i.e. perhaps as a go between for parts etc, that Iran cannot get due to sanctions) So I am sure it is a beneficial relationship that Mahmoud and Hugo have, but there are other things under the crust that one has to take into account. Proximity is one issue that I know has been spoken of before and it has to be discussed again. There has been talk in the past of Iran and Hugo’s desire to have a set of missile bases in Venezuela that could easily launch missiles at the US. With the Iranian technology that they have, they could in fact put in sites that, much like the Cuban affair back in the 60’s, cause great consternation for us all. I have heard in the past that there was talk of this between the two countries and heads of state, but, now it seems that perhaps we should be more wary that perhaps there are some sites or portables that Iran may have slipped to ol’ Hugo. 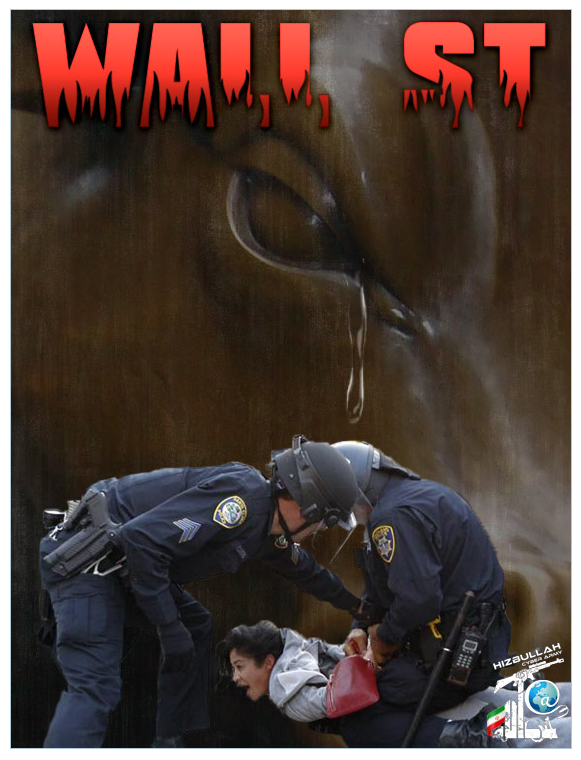 However, the other issues brought up by the report from Univision do take some precedence today. The proxy war of using the Narco gangs to train Islamist terrorists is not a new one by any means, but, seems to be bearing fruit now. For some time the terrorists and narco traffickers have been getting closer because their needs can be fulfilled by both working together. Much of this also is being backed up (allegedly) by the Univision reporters who now also claim to have hours of tape on Muslim jihadists training with the drug smugglers on tactics in training camps tucked away in South America. Though, the real relationship to me, is that the drug gangs are being used as proxies for Iran’s and only for Iran’s benefit.. They simply are pawns in a bigger game of global Stratego that Iran wants to play. They are also all being played by Hugo Chavez, who gets the money, the power, and the control he desires all the while getting in on the ground floor on the war against the “Great Satan” as Iran calls the US. Another disconcerting event came yesterday as it was announced that a Lebanese drug smuggler was charged in the US for smuggling 85K kilos of cocaine into the states. Ayman Joumaa a.k.a “junior” was captured and is now being charged with this crime as well as being the money man for Los Zetas, using a Lebanese bank in Canada to launder about $850 million dollars. Joumaa’s connections though also connect him with Hezbollah and thus, we now have more connections between the likes of Hezbollah and Los Zetas. If you will remember back a bit, you will likely think about the plot that was broken up recently where Iran (Hezbollah) had worked a deal with Los Zetas (allegedly) to bomb a Saudi ambassador while in NYC. Many people thought that the plot seemed a bit cooked up and perhaps overly dramatic, even perhaps some thought that it was disinformation, but, it seems that from numerous sources you can see a pattern emerging between the cartels, islamist terrorists, and the inspirations of Iran and Venezuela. Further proof comes from the Antisec/LulzSec dump of the AZ DPS reports on the connections between the Islamic extremists and the Hezbollah network in Mexico. Clearly the government seems to be concerned. By using the Zetas, Hezbollah will have a far greater reach into this country through the trafficking routes, coyotes, and money that they are facilitating being made to launch campaigns here in the states… Someday. In the end, this report shows quite a bit about how the Islamic jihad and Hezbollah have made inroads into South America. Inroads that could lead to some serious consequences with global terrorism as well as the goals of Iran as a whole where the US (a.k.a Shaitan) are concerned. It would seem to me that the 80’s are coming back and we will find ourselves once again sending wet work teams in country to work against such groups as ETA, FARK, and now Hezbollah in South America. However, you will get to see that Univision did their homework and connect the dots pretty well between the governments of Columbia, Venezuela, and Iran in complicity on a plan like the one offered. So, it could be possible in the future to see such attempts as plausible. 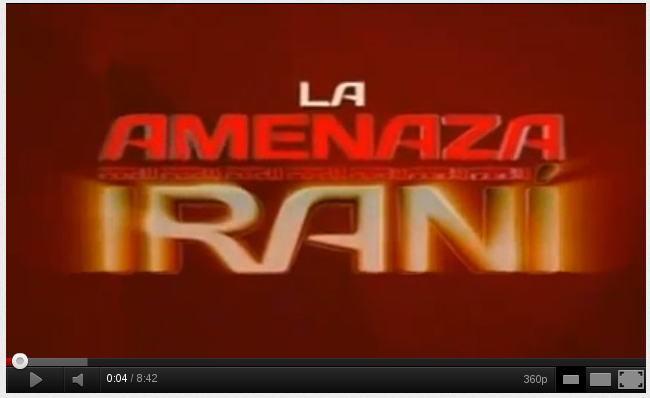 We definitely have to keep an eye on the region and the machinations of the likes of Chavez and Mahmoud. So when do we get the second “New Wave” movement from Britain then?